As one of the five autonomous regions of the People's Republic of China, the Tibet Autonomous Region exercises jurisdiction over one city (Lhasa City), one district directly under the Lhasa city government (Chengguan District), six prefectures (Nagqu, Qamdo, Nyingchi, Shannan, Xigaze and Ngari prefectures), one county-level city (Xigaze City), and 71 counties. Lhasa is the capital of the region. Xigaze is its second largest city. Other major cities and towns include Zetang Town, Bayi Town, Nagqu Town, Chengguan Town, Shiquanhe Town, Gyangze Town and Zam Town. Located in the central south part of Tibet, Lhasa City lies on the northern bank of the Lhasa River, a tributary of the Yarlung Zangbo River. Covering an area of 31,622 square km, the city is home to more than 30 ethnic groups including Tibetan, Han and Hui, of which Tibetans account for more than 87 percent of the total population. The city enjoys an average annual temperature of 7.5 degrees Centigrade, the January average being 2.3 degrees Centigrade and that in July 15.4 degrees Centigrade. It falls into the category of a highland monsoon climate. Its major grain crops include qingke barley, wheat and corn, while its economic crops include potatoes, turnips and cabbages. Its medicinal herbs include Chinese caterpillar fungus, caladium, rhodiola root, snow lotus, ginseng fruit, musk and pilose antler. Its wildlife includes wild yaks, wild donkeys, Mongolia gazelles and Tibetan antelopes. Its traditional handicrafts include waist knives, kardian cushions, carpets, bamdian aprons, wooden bowls, and gold and silver jewelries. 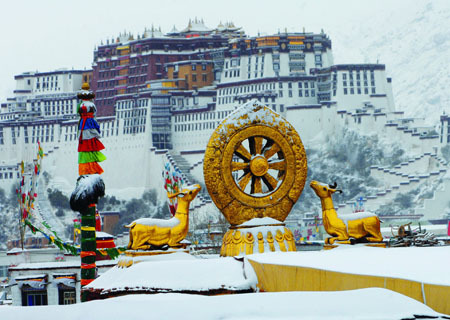 Lhasa has opened more than 200 scenic spots, including some 20 major ones, such as the Potala Palace, Jokhang Monastery, Ramoche Monastery, Norbu Lingka, Zhaibung Monastery, Sera Monastery, Zongjab Lukhang, Gandain Monastery, Curpu Monastery and Razheng Monastery. Its major sceneries include the Nam Co Lake, Yangbajain Geothermal Field, snow peaks of the Nyainqentanglha Mountains, hot springs at Dezong and Doilung, and nature reserves in Lhunzhub and Meizhukongka. Nagqu Prefecture lies in northern Tibet abutting Xinjiang and Qinghai. Its total area is 286,500 square km. More than 98 percent of its population is Tibetan and their main livelihood is livestock breeding. The Tsangdain Monastery in Nagqu, first built in 1667, houses many murals and sutra books, which are of great artistic and cultural value. The central and western parts of Nagqu belong to Changtang, lying at an average elevation of over 4,500 meters. Maintaining a primitive ecology, the prefecture is dotted with some 1,000 rippling lakes including Nam Co, Serling Co and Tangra Yumco, as well as many hot springs and geothermal fields. There are over 20 animal species subject to State first and second class protection. Major special products include oxen and sheep wool, Cashmere goat wool, caterpillar fungus, snow lotus flower, caladium and musk. Major scenic spots include the Shaten Monastery located in Nagqu County, Arza Lake and Drongyul Township Scenic Area in Jiali County, Nujiang River scenic area and Bomphan Primitive Forests in Biru County, as well as the Batang Monastery of the Bon religion, Lungkar and Lupug monasteries. Located in eastern Tibet, Qamdo Prefecture abuts Yunnan and Sichuan provinces to the east, and Qinghai Province to the north. The Sichuan-Tibet, Yunnan-Tibet, Qinghai-Qamdo and other trunk roads meet here. Covering an area of 130,000 square km, this prefecture is home to the Tibetan, Han, Mongolian, Naxi, Lili and Hui ethnic groups. There are some 80 high peaks each with an elevation of over 5,000 meters in the prefecture. In the river valleys, forests and natural pastures live more than 600 species of wildlife such as snow leopards, pandas, Yunnan golden monkeys and white lipped deer. It is rich in some 1,200 kinds of medicinal herbs including caterpillar fungus, musk and young pilose antler. Major scenic areas include Qambaling Monastery, Karu New Stone Age Ruins, Zugung County's Meili Snow Mountain, and Zaya County's cliff sculptures and Lunglung stone carvings. Located in southeastern Tibet, Nyingchi Prefecture is on the middle and lower reaches of the Yarlung Zangbo River. It abuts India and Myanmar to the south. Covering an area of 99,700 square km, it is home to the Tibetan and Han, as well as Moinba and Lhoba ethnic groups. Under the impact of the warm air current from the Indian Ocean, Nyingchi Prefecture is free from unbearably hot weather in summer and freezing cold in winter. It is blessed with plentiful precipitation and humidity. Forests covering 2.64 million hectares teem with giant spruce trees some more than 200 years old, while the oldest cypress tree is 2,500 years old. Timber reserves exceed 800 million cubic meters. The number of known higher plants reaches some 2,000. The lowest elevation is about 1,000 meters. Some places in the prefecture are suitable for growing rice, oranges, bananas and lemon. Rare wildlife includes Bengal tigers, Yunnan golden monkeys, leopards, bears and antelopes. Native produce include tube of elevated gastrodia, pseudo ginseng, fritillaria, Hongjintian, Chinese caterpillar fungus, glossy ganoderma and other medicinal herbs, as well as more than 120 kinds of fungi. Nang County's Tibetan hats and wooden bowls, Bome's "Qomolangma tea", and Ye'ong Tibetan knives, Zayu's woven bamboo products and Tibetan wooden bowls are famous in China. Nyingchi boasts eight scenic areas comprising 40 scenic spots. They include ones acknowledged as outstanding by world tourism organizations, 4A ones recommended by the China National Tourism Bureau, as well as the national forest park known as Basum Co Scenic Area. Others include the Nam-jiagbawa Scenic Area, Yarlung Zangbo Grand Canyon, Yi'ong Geological Park and Serchila State Forest Park. Located on the middle and lower reaches of the Yarlung Zangbo River, Shannan Prefecture abuts Bhutan and India to the south. Covering an area of some 80,000 square km, it is home to the Tibetan, Han, Hui, Moinba and Lhoba ethnic groups. Tibetans occupy 98 percent of the total population. As one of the major cradles of the Tibetan race, Shannan has a long history. It has 10 cultural relic sites subject to national protection, including the Tombs of Tibetan Kings, Samye Monastery, Changzhub Monastery, Zhatang Monastery, Jidui Tubo Tombs Group, Leshan Tomb, Lhagyali Imperial Palace Ruins, Namserling Manor, Gyiru Lhakang, as well as holy mountains and holy lakes. 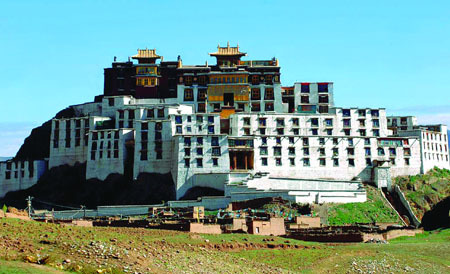 Yumbulhakang was the first palace built in Tibet (the 2nd century BC). The Yarlung River State Class Scenic Area is the only one of its kind in China. It boasts snow-covered mountains, glaciers, pastures, unspoilt river valley, and places of historic interest. The prefecture has three tourist sites featuring scenic beauty and human interest, namely, Yamzhog Yumco Lake Scenic Area, Samye Scenic Area and Holy Lakes Scenic Area. Native produces include pulu woven woolen fabrics, Tibetan joss sticks and kardian cushions. Shannan Prefecture is an area with sound transport facilities. Lhasa Gonggar Airport is located in Gyizholing Town of the prefecture's Gonggar County. Located in central south part of Tibet, Xigaze Prefecture abuts Bhutan and Nepal. 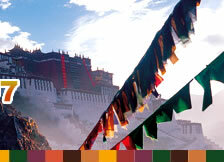 Covering an area of 180,000 square km, it is home mainly to Tibetans. Other ethnic groups found here include the Han, Hui, Mongolian, Naxi, plus Sherpa people. The prefecture is home to many plateau pastures, fields, forests, and snow-covered peaks. The Qomolangma Nature Reserve boasts the world's highest most intact vertical eco-system. 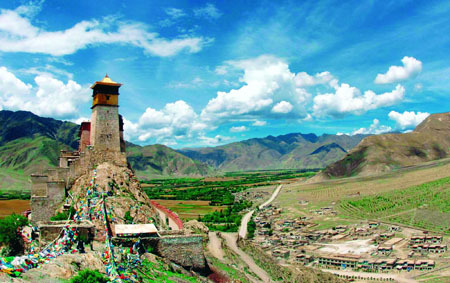 Major places of historical interest include Tashilhungpo Monastery, Sagya Monastery, ruins of the Zongshan Mountain Resisting the British Invaders Site, Xialhu Monastery, Deqoi Monastery, Zholma Lhakang and other cultural relics units, as well as the Natang Monastery, Rongbu Monastery, Palkor Monastery and the site of the former Parlha Manor. Xigaze Prefecture is major area for the development of mountaineering in Tibet partly because it boasts five peaks each rising at least 8,000 meters above sea level: Qomolangma (8,844.43 meters), Lho Tse (8,516 meters), Makalu (8,463 meters), Cho Oyu (8,201meters) and Xixabangma (8,012 meters). In the past two decades or so, China has opened 44 high peaks and mountaineering routes. 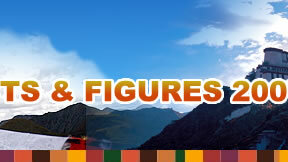 Foreign mountaineering teams climbing Qomolangma now number over 20 a year. Native produce of the prefecture includes wooden bowls wrapped in silver, tea tray and frames, Tibetan carpets, golden thread hats, Tibetan knives and kardian cushions. Located in western Tibet, Ngari Prefecture abuts Kashmir, India and Nepal to the south and west. With the border extending 116 km, the prefecture has over 60 mountain mouths leading to other parts of the world. Of the seven counties under its jurisdiction, three engage entirely in livestock breeding, and four in mixed farming and livestock breeding. It covers an area of 303,000 square km, with relatively low population density. The ruins of the Guge Kingdom were listed among the first group of cultural relics subject to national protection in China in 1961. The prefecture holds an important place in China's cultural and economic exchanges with the west. It is home to ancient civilization of Zhangzhung and the Bon religion. With an average elevation of 4,500 meters, the prefecture is full of scenic wonders including glaciers, extensive plateau plant coverage, Gobi desert, rippling rivers and lakes, green fields, clay forests, and wildlife. Its Shiqianhe River, Kongquehe River, Xiangquanhe River and Maquanhe River are respectively sources of the Indus, Ganges, Sutlej and Yarlung Zangbo Rivers. 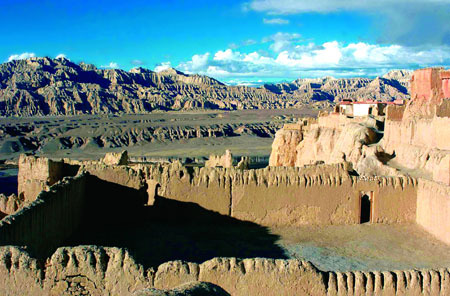 It is also home to the sites of many ancient civilizations such as the ruins of Guge Kingdom, Toding Monastery, Donggar Frescos and Ritog Cliff Paintings. In Burang County is the holy mountain of Kangrenboqe, the chief peak of Kangdese Mountains, and the holy lake Mapang Yumco. Both hold an important place in Asian religious history. Ngari Prefecture also has five world-class tourist sites, 18 State class ones, 48 regional level ones. Tourism has grown into a major contributor to local economic growth.